Photo source: Copyright © Matt Brandon. Used with permission. The Gujur are comprised of three very closely related people groups that are known collectively as the "Gujur Rajasthani." They are located in Afghanistan, Pakistan, and several states in northeastern India (Himachal, Madhya Pradesh, Uttar Pradesh, Jammu, Kashmir, and Rajasthan). In addition, the Gujarat district of western India is named after the historic Gujur peoples. 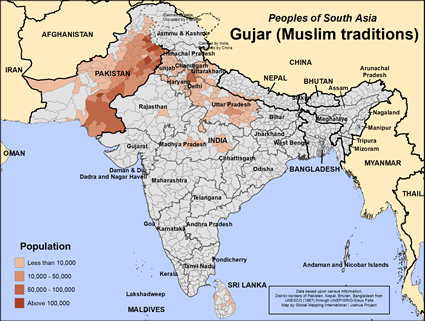 As various Muslim groups began invading India and Pakistan in the eleventh century, the Gujur Hindus converted to Islam. When this happened, their resentful Hindu neighbors began to rise up and take control of the area. The Gujur were forced to leave the region and search for good pastures elsewhere. Their wanderings took them into Pakistan and Afghanistan, where thousands have remained until this day. The partition of Pakistan and India in 1947 also caused many tribal migrations. Masses of Muslims immigrated to Pakistan, while the Hindus flocked to India. Ever since their conversion to Islam in the eleventh century, the Gujur have been bound by a life of poverty, illiteracy, and social oppression. In general, they are a simple, inoffensive people with a generous, hospitable nature. Today, most of the Gujur living in India live as law-abiding shepherds and farmers. Unfortunately, they are still belittled by those of higher castes (social classes), and often labeled as thieves and vagrants. The Gujur living in the mountain forests of northeastern India raise buffalo. Unfortunately, the Indian government has imposed regulations on the number of buffalo a family can keep, and on how long they can live in the forests. This has been distressing for the Gujur, since this is their main source of income. For this reason, these nomads are constantly searching for new pastures for their herds. The Gujur nomads who live in the state of Kashmir are often cheated by the middlemen who take their agricultural products to the city markets and sell them as their own. The Gujur castes are broadly divided along religious and geographic lines into two groups: the Muslim Gujur and the Hindu Gujur. The Muslims are seasonal nomads who live in windowless, one-room houses during sedentary growing seasons; whereas, the Hindus are settled farmers who live in the same place all year. Most of the Gujur in Afghanistan are nomadic groups who earn their living as tinkers (traveling menders of household goods), musicians, tradesmen, or fortune-tellers. Many are extremely poor and have resorted to begging and crime. Others are nomadic goat herders who travel the eastern valleys during the summer months. Unfortunately, conflicts between Afghanistan and Russia in recent years have damaged the economy for those who work in agriculture and trade. The Gujur living in the forested mountain regions usually build their homes in clearings along the mountain fringes. The dwellings have one, two, or three rooms and are built with flat roofs. In contrast, the homes of those living in Kashmir typically have angular roofs. Since they cook inside over open fires, their homes are often dark and smoky. The Gujur are divided into hundreds of clans. Their societies are patrilineal, which means that inheritances are passed down through the males. Marriages are usually arranged by the parents, and a "bride price" of either cash or buffalo is paid to the girl's family. They are permitted to marry outside their clans, and young couples generally live near the grooms' parents. All three Gujur groups speak Gujuri, an Indo-Aryan language. This common factor has helped to identify them as a distinct sub-group. 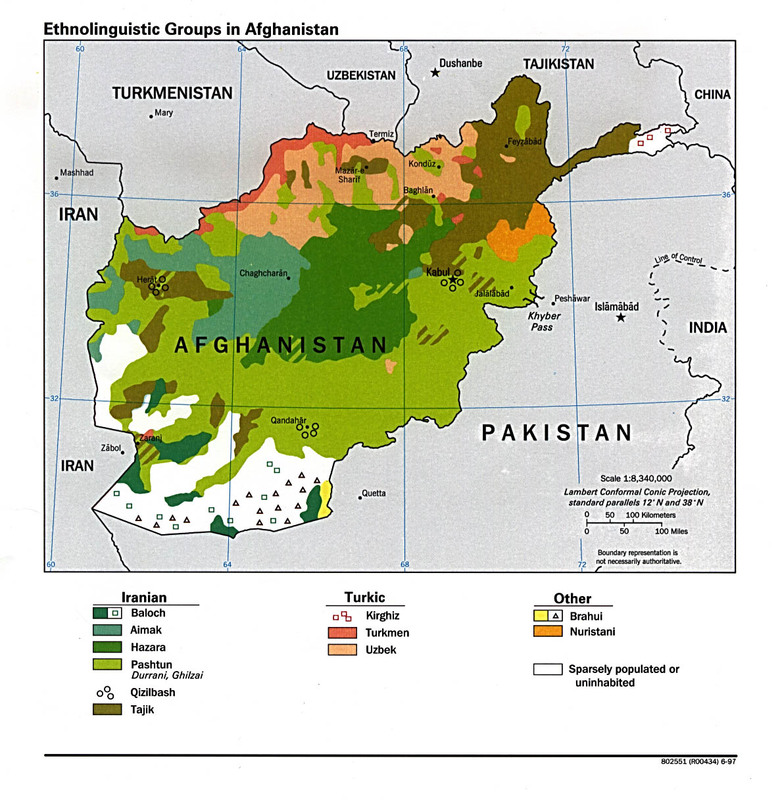 The Gujur of Afghanistan also speak Pashto and/or Dari, which are Persian languages and are spoken by the majority of the Afghani population. A majority of the Gujur are Muslims; however, those who are Hindus have greatly influenced the others. The Gujur may worship a "family deity" and observe some of the traditional Hindu feasts such as Holi. Because the Muslim Gujur share Hindu customs, they are not generally accepted by other Muslims. Nevertheless, in their desire for a unified front against the Hindus, the Muslim Kashmiri have agreed to accept the nomadic Gujur Muslims who recently entered Kashmir. The Gujur have long been hidden away and forgotten by most of the world. The governments of the countries where they live can be hostile to any form of proselytizing; and so government restrictions apply, but most of the time Christians can follow their own religion. There are more problems from family members than from the government. * Ask the Lord to send forth laborers to share Christ with the Gujur. * Pray that God will encourage the small number of Gujur believers and give them a vision to reach their own people. * Ask God to send Christian teachers to live and work among the Gujur. * Ask the Holy Spirit to soften the hearts of the Gujur so that they will be receptive to the Gospel. * Pray that God will open the hearts of governmental leaders to the Gospel. * Pray for the availability of the Jesus Film in the primary language of this people.View Gujar (Muslim traditions) in all countries. Location in Country: Scattered. Nomadic, traveling in summer in eastern valleys.